I heard so much about this foundation when it recently came out so of course I had to get it myself and give it a go. 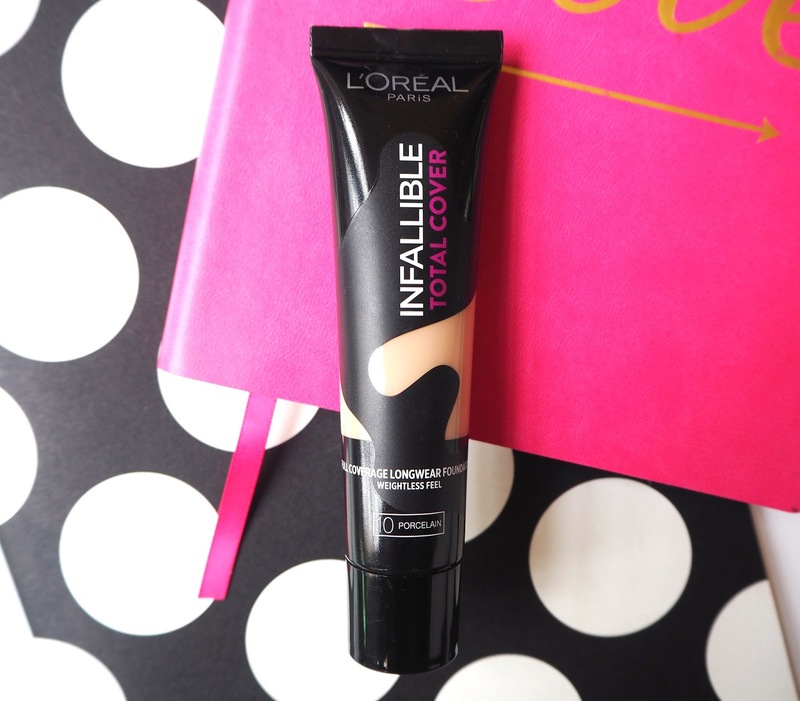 I absolutely love the 24 Hour Matte Infallible Foundation from Loreal so I marched off to Superdrug having high hopes for this one. I picked up the same shade as I am in the Matte version, which is 10 Porcelain, and found it to be a pretty good match, a hint too dark maybe but thats fairly standard for me and my pasty complexion. The idea of this foundation is that it should cover redness, blemishes, dark circles and even tattoos hence the name 'total cover'. I was expecting a very full coverage and hoping this would be great for bad skin and tired skin days! I gave this a fair few goes and I have to say, I don't love it, in fact I'm pretty disappointed. The application of this wasn't too bad, it has an almost mousse like, whipped texture so does feel quite lightweight. It did take a bit of work with a buffing brush but eventually I managed to get it look fairly even and it did make me look nice and matte. I wouldn't say this covered up blemishes any better or worse than a typical foundation and I had to go back in with concealer in the usual places. My skin is combination but definitely more oily than dry, if I do get dry patches it tends to be around my nose but these don't tend to pose a huge problem. Once I applied this to my face it had gathered in the dry patches and was just hanging on it there around them. My skin looked so incredibly dry, I was pretty surprised by this as I've not really had this issue before! In fact it looked so dry that I was almost tempted to take it off and apply something else. But I continued to wear it to see what happened throughout the day. Unfortunately it didn't get much better *sad face*, it just sat on my skin, emphasised dry bits and after a while the natural oils in my face really started to break this down. For me I love a foundation with good longevity, I don't mind having to powder once or twice in the day but with this I didn't really want to powder as I thought it would just add to the problem. Far away it probably didn't look too bad but when I looked in the mirror I could see easily that this was making me skin look dreadful. If I had to recommend this, you can probably guess, I wouldn't. I usually try to use up products, in particular foundations as I hate wasting them but I won't with this one. I'm really intrigued to know what people think of this one as I haven't heard a huge amount of other opinions. Of course if you love this foundation then thats great! Let me know what products you wear this with and how you find it best applies, maybe I'm doing something wrong? I hope so anyway! Oh what a shame, I hadn't tried this yet and most likely won't as my skin is really dry, most foundations cling to my dry patches.